Next year’s Fleet World Honours are now open for entries, including a brand-new category that will recognise cutting-edge advances in electric mobility solutions for fleets. 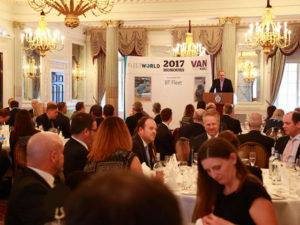 The Fleet World and Van Fleet World Honours 2017 at the RAC Club, Pall Mall, London. Celebrating the latest developments by fleet industry suppliers, the 2018 Fleet World Honours – the most prestigious event on the fleet calendar –will once again cover categories for innovation in contract hire and leasing, customer service, SMR, remarketing, risk management, driver management, rental, fuel saving/management, cost reduction, mobile comms, telematics and accident management. But next year’s Honours – which will be held on Tuesday 13 February at the RAC Club, Pall Mall, London – will also shine a light on the rapid advances being made by the fleet industry in the field of electric mobility, helping end-user fleets to make the shift to running ultra low emission vehicles. And the 2018 Fleet World Honours will again recognise the latest developments by carmakers, including Fleet Manufacturer of the Year, Most Improved Fleet Manufacturer and Best Ultra Low Emission Vehicle, while also awarding the leaders within each car category. Meanwhile the Honours will also recognise fleet operators at the forefront of innovation, with the Fleet Environmental Award, Fleet Safety Award and Fleet Management Award. Both the fleet operator and manufacturer awards are not open for submissions and are judged entirely by the Fleet World Group editors.